With a picture from a meeting between Bayern Munich and Werder Bremen (Germany peace and glory to Paul octopus, by the way), EA Sports presents the new graphics engine which will benefit the football game FIFA 11 in its PC version. This is good news for ages hoped for players who still persisted in believing in the future of the series on PC! The most obvious improvement is to model faces, a ground on which FIFA had been overtaken by its rival PES in recent years, either on consoles or PC elsewhere. It is recognized in any case without those evil Mesut Özil and Arjen Robben on the capture. But the stadiums and grandstands are not left out and enjoy a visual rendering in high definition which will have nothing to envy his counterpart console. 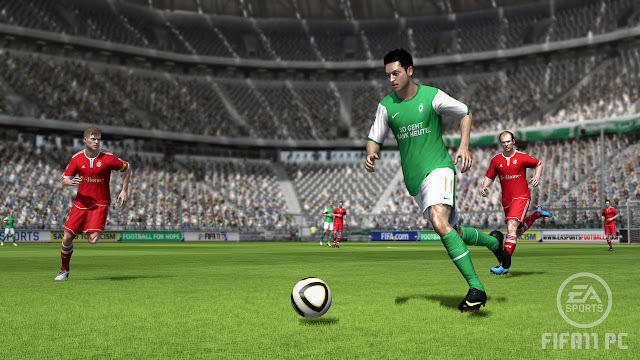 EA Sports says that the new graphics engine has 2 years of development. But the wait was worth the trouble obviously!